Cut the lemons into slices half a centimetre thick. Sprinkle with salt, arrange in layers in a shallow dish, finish with a covering of salt. Keep cool for six hours. The lemons will absorb the salt, release their juices and soften. Remove the salt from the lemons by gently patting with a paper towel. Discard the remaining juice, as it is no longer needed. 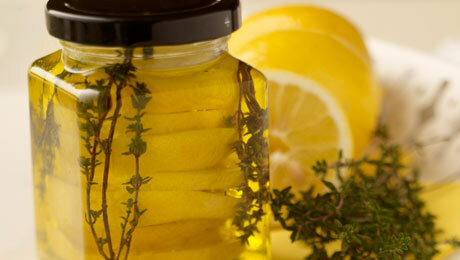 Arrange the lemon slices in layers in the jars and finish by covering completely with olive oil. Lastly add a sprig of thyme to the jar. Leave the oil to infuse for at least 24 hours before use. This product will solidify if placed in the fridge so store in the cupboard and use within 3–4 weeks once opened.